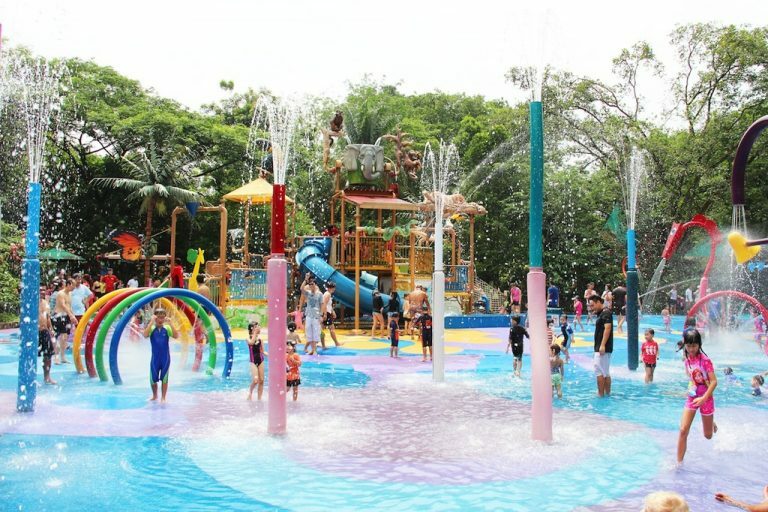 20 Water Playgrounds in Singapore Where Kids Can Beat The Heat! 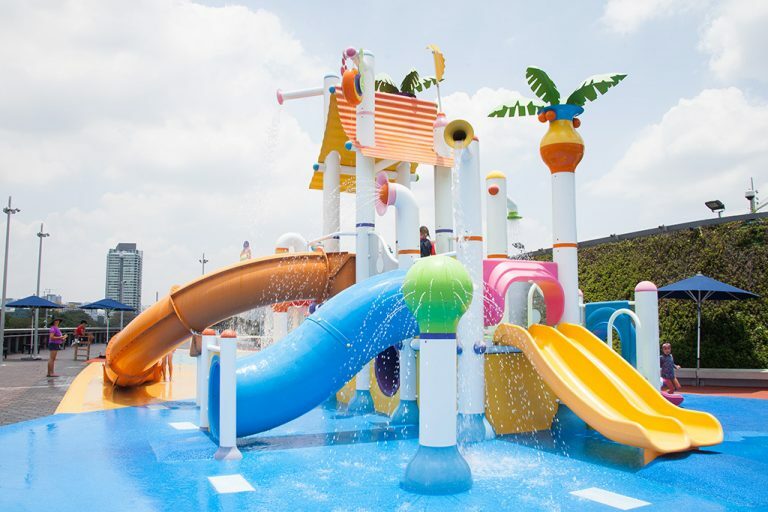 20 Water Playgrounds Your Kids Can Have a Splashing Good Time at While Beating The Heat! 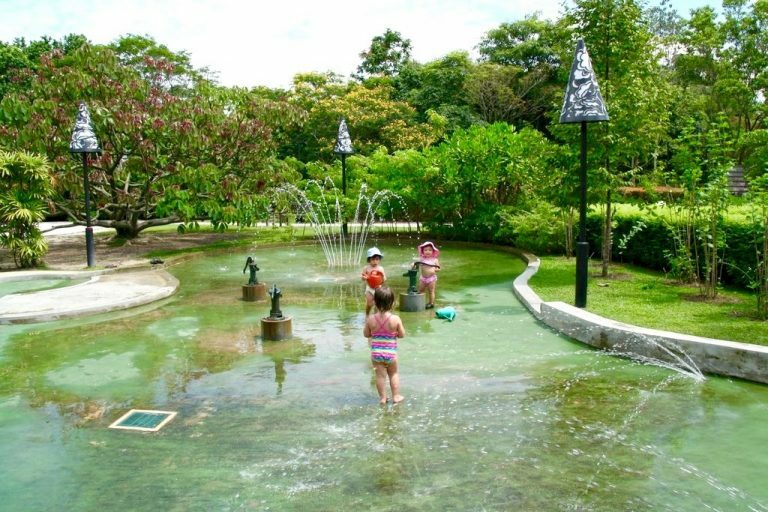 We’ve combed the island to bring you this list of 20 water playgrounds you really should be taking your kids to for some much needed respite from the tropical heat. Temperatures are soaring higher than usual these days. When us grownups ourselves can’t bear the scorching heat, imagine the plight of our little ones. The solution? 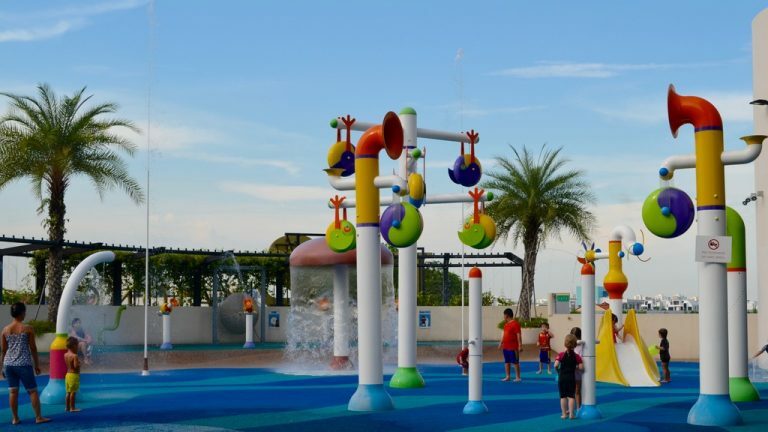 Bring your kiddos to a water playground to cool off while having a splashing good time! What is it about these water playgrounds that’s so appealing to children? Well, think hovering buckets of water that tip over at intervals, water spray guns and brightly coloured whimsical structures which spout… well, water. You get the picture. 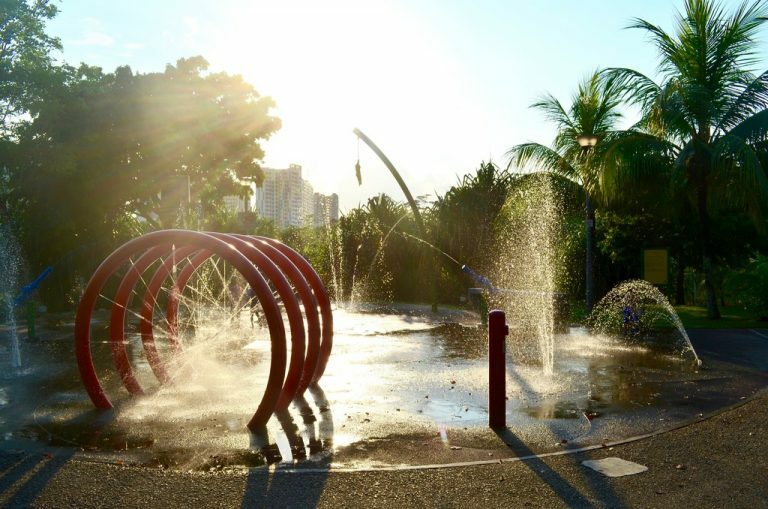 So grab a change of clothes, a towel and some sunscreen before you head down to one of these 20 water playgrounds scattered islandwide – we’ve grouped them geographically for you! Needless to say, the tots will require no instructions to start making a beeline for them. 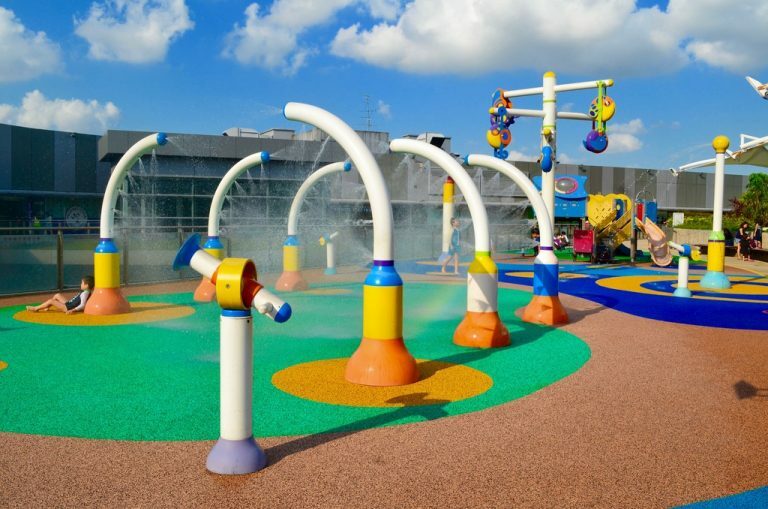 Situated at the Garden Plaza on level 3 of IMM is a water playground complete with fountains, water cannons and buckets. 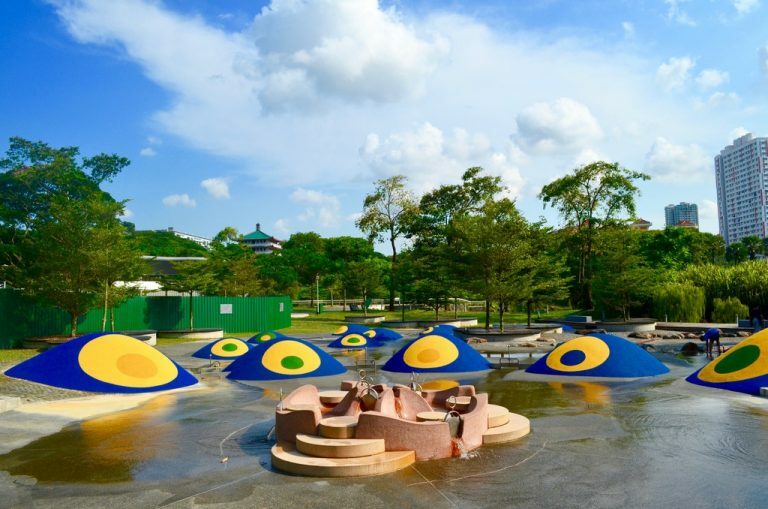 Little ones can run about freely on this rubber-padded water play area while interacting with the fountains – they get to control how and when water squirts out from them! Do be prepared with your shades, a wide-brimmed hat and lots of sunscreen for there are no shelters here and it can get pretty sweltering in the afternoons! 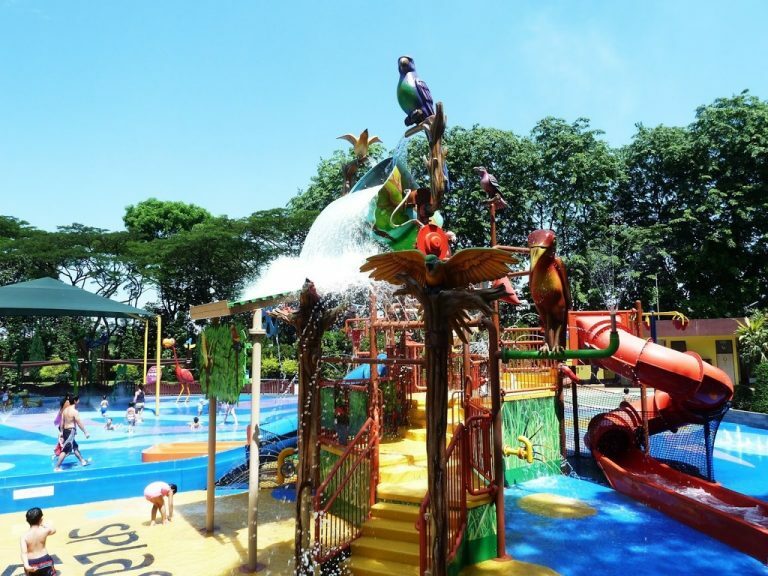 Stairs for little feet to climb up and down, slides to tumble down and massive buckets of water tipping over from time to time are some of the water play elements your tots can look forward to at the Birdz of Play water playground at the Jurong Bird Park. We think the wading pool complete with water cannons in the shape of beautiful birds will be more suitable for the littler ones to have a splash-about in. 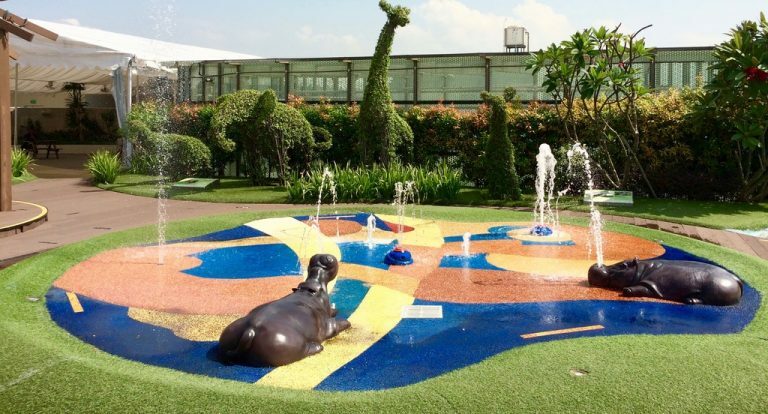 This modest sized water playground at the rooftop of Lot One is an adorable animal themed one – the water pipes are fashioned after giraffes, frogs and elephants! The water jet tunnels and water guns are more than enough to keep kids amused while taking a much needed break from the scorching heat. Young toddlers may not be tall enough to reach the water guns though, so be sure to lend them a helping hand! 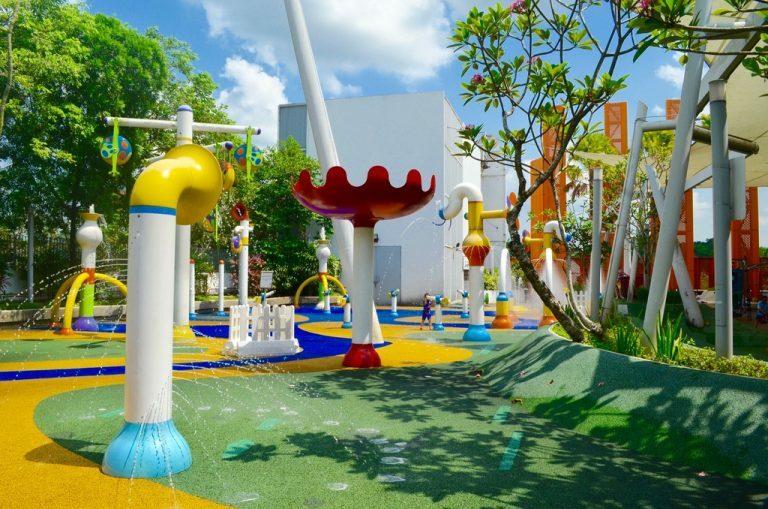 It’s not all just fun and games at Science Centre Singapore’s water playground. Young ones will get to learn about the water cycle and other intriguing scientific concepts while having a splashing good time here. Kids can be introduced to how gravity and weight work at the Water Clock Tower. Rotate the wheels at the bottom of the tower to fill up the buckets – the bucket that gets filled up first will tip over, spilling its contents into the one below! In case you weren’t aware, the rooftop level of Westgate is dubbed Westgate Wonderland – and not without good reason. This quaint water playground has been created with a fantasy garden theme in mind so it’s sure to be a hit with kids and grownups alike. The highlight here? An enormous yellow watering can which spouts water onto unsuspecting passers-by at regular intervals. There’s also a blower room here for wet little ones to dry themselves before heading home! In stark contrast to other water playgrounds which feature colourful fountains and slides, this one surrounded by lush greenery offers its patrons a simple but smart design. There are elements like sluice gates and ropes for children to get hands-on with to observe the movement of water and learn more about its properties. While the kids get drenched, parents can sit back and enjoy the tranquility of Mother Nature. 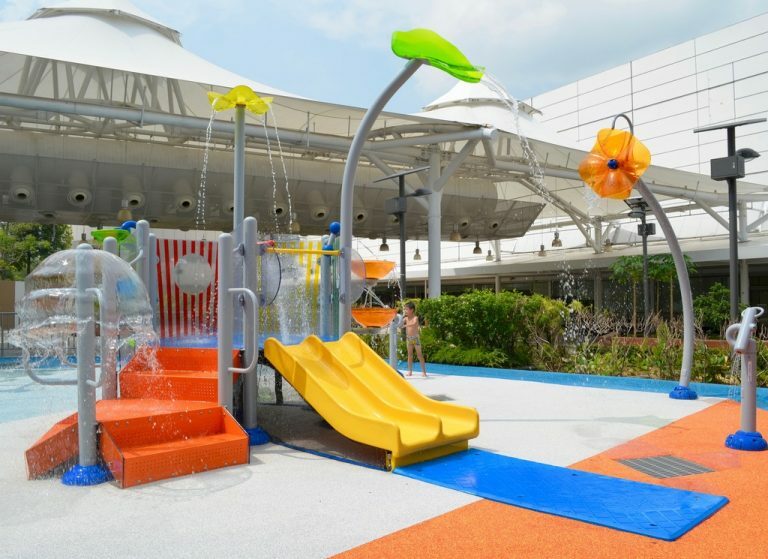 You’ve probably visited the outdoor playground on the second level of Causeway Point, but did you know that there’s also a water playground within the mall? Yes, that’s right. It’s all the way up on level 7, so you might have missed it on previous occasions. Let your little ones have a ball of a time playing with the water guns and running through the water jet tunnels here. Oh, and the bucket of water that tips over at intervals is sure to get them squealing in delight! If you dislike being at crowded water playgrounds at malls, then this will be the perfect spot for you. The water play area at Lower Seletar Reservoir Park is one of the lesser known ones so it’s quieter than the others. The open space has fountains, a shallow wading area with miniature “rivers” and water mills for little ones to explore. It would be best to save a visit here for the evenings as there aren’t any shelters here and it can get very hot in the afternoons! Here’s another one of those water playgrounds we bet you didn’t know existed. Located at Sembawang Shopping Centre, it’s not exactly the most accessible since it isn’t a stone’s throw away from an MRT station. But hey, there are scheduled shuttle buses to this mall and you can hop on for a round of shopping at Giant Hypermart before heading to the rooftop for the kids to have fun with the water play structures! Housed within Rainforest Kidzworld is the Singapore Zoo’s fabulous animal themed water playground. There are loads of colourful water sprayers, water slides and tubes, tower showers, rain arches and fountains hidden on the ground, so no matter how hard you try to shy away from the water, you’re going to get drenched for sure! Forgot to bring a change of clothes? No problem – pick up some zoo-per t-shirts at the nearby gift shop. 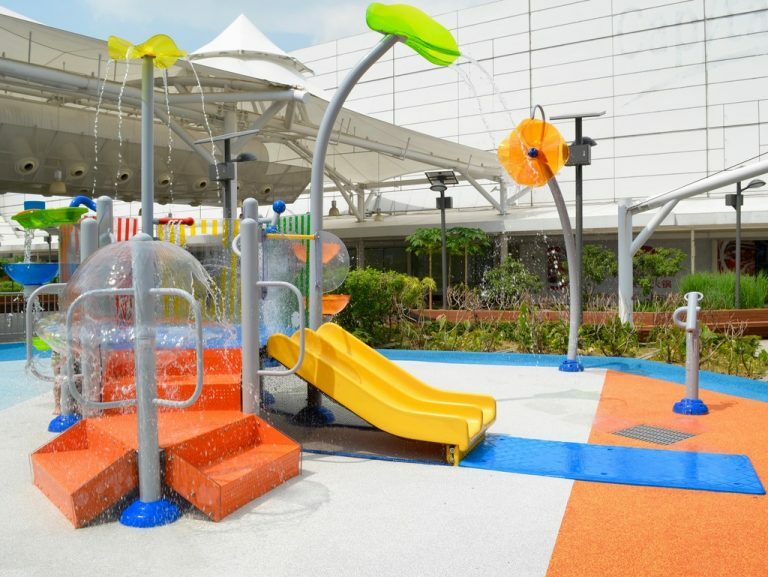 If ample space for your kids to run amok is your top-most priority when it comes to water playgrounds, then the one at Nex will be just perfect for you. There’s lots of room here for children to deplete their energy while cooling off on a really scorching afternoon. 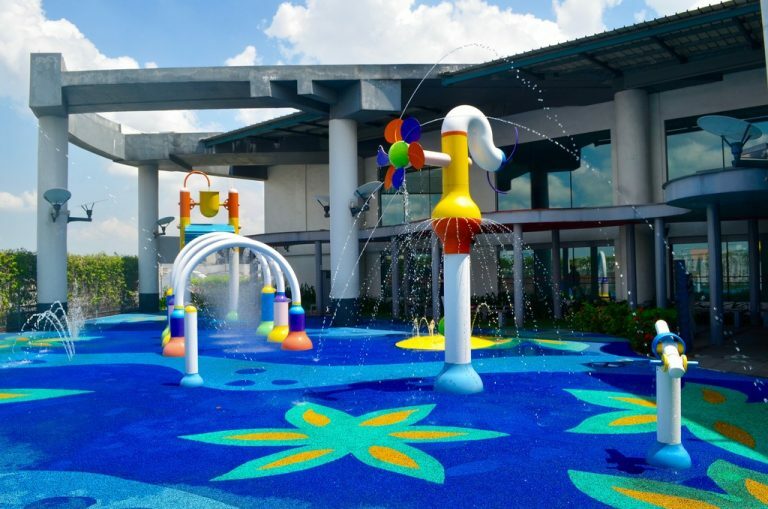 This water playground is situated on the rooftop of the mall and also has a dry playground just beside it. 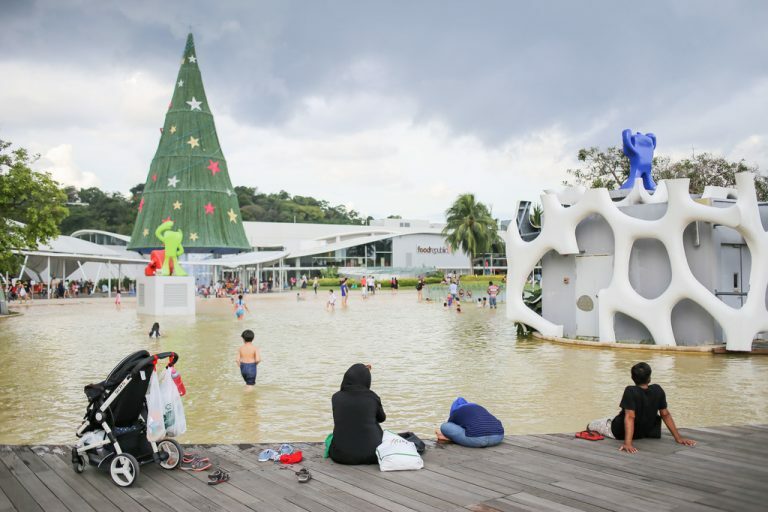 From a gigantic tipping water bucket to mist machines, there’s lots of ways to get soaked here! 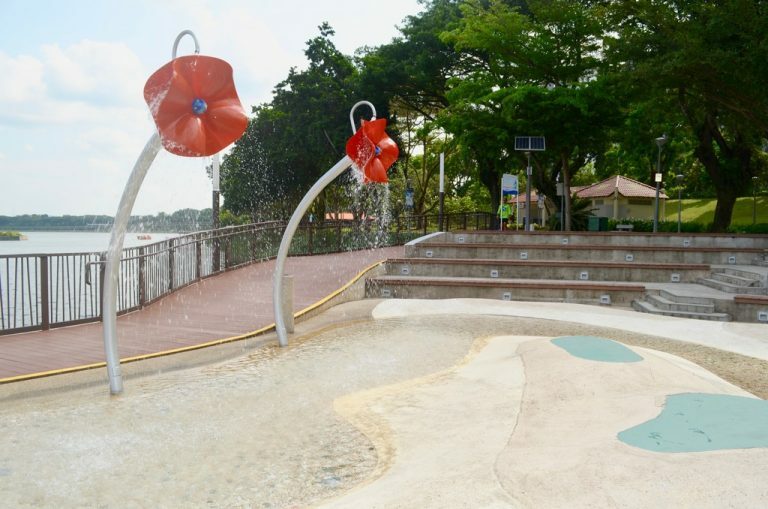 Over at the recreation zone of Punggol Waterway Park, you’ll find a small water playground that’s enough to thrill water-loving little ones. 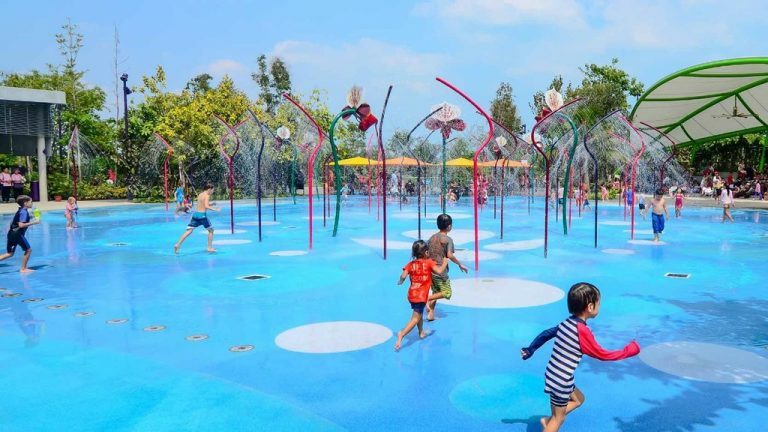 There aren’t many water play structures at this park located rather near Punggol MRT station, but we think the squeal-worthy fountains and water cannons will be able to provide your kids with some respite from the heat. Be sure to dash through the orange ringed structure for a good soak! 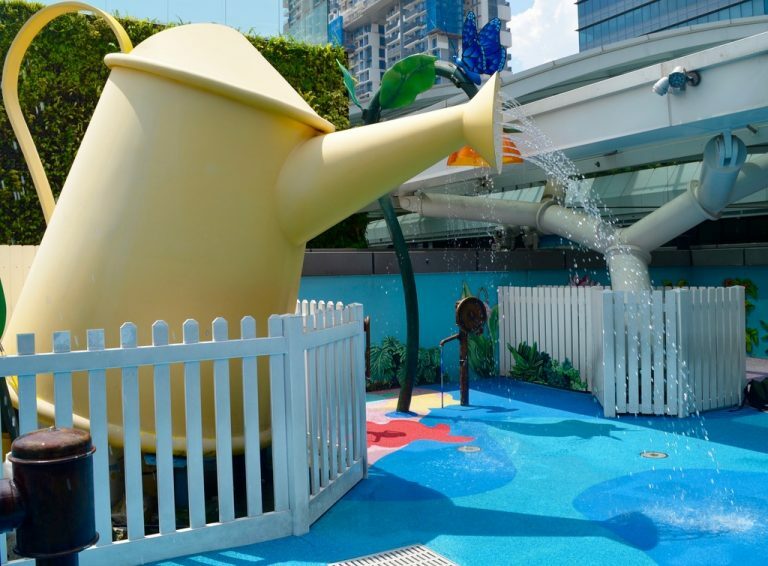 Say hello to wet slides, swings, water sprays, tipping water buckets and a pair of huge mushroom shaped fountains at the water playground on level 4 of 112 Katong! There’s no lack of safe aquatic fun for kids here – the ground is rubber-padded so that little ones will not slip when they run through the play area squealing in delight! Outdoor shower stalls are located nearby for you to get your kiddos cleaned up after an afternoon of water play. 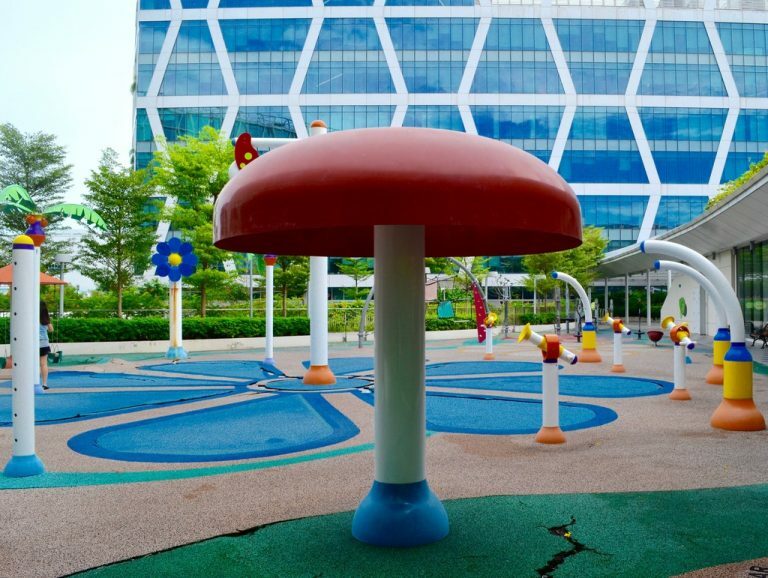 Just next to Koufu on level 2 of Changi City Point is a water playground which is home to a giant bright red mushroom shaped fountain, water cannons and water sprayers. A shallow ankle-deep wading pool with swings suspended above it is sure to be a hit with children (and some grownups) who adore swings! There’s also a kid-friendly rope course at this vividly coloured water play area. Mums and dads can keep an eye on their tots from the many benches lining the playground’s perimeter. 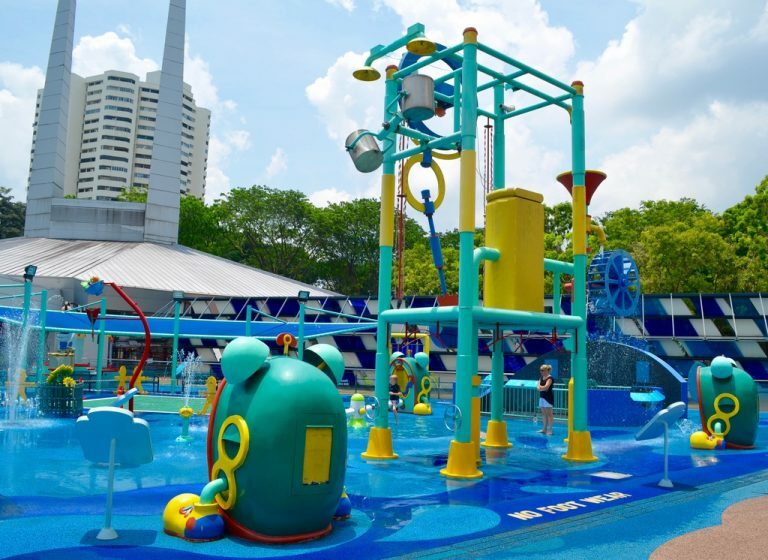 Splash-N-Surf at Kallang Wave Mall is undeniably one of our most favourite water playgrounds in Singapore! 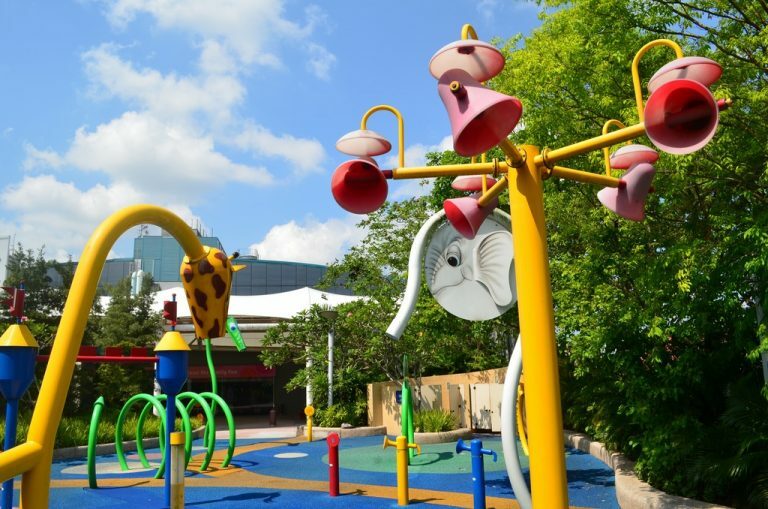 Whimsically designed, the play area boasts impressive water slides and turnstiles to keep the little ones occupied. The mini children’s pool just beside the main area is perfect for your bubs and toddlers to wade about in under supervision. The highlight here? The Lazy River! For a small sum of $2 per person, you and the kids can enjoy a lazy drift along its length. If your kids are animal lovers, you have got to take them to the water playground on the rooftop of Tampines 1 someday. The water slides within the wading pool are shaped like adorable polar bears and seals while the fountains resemble chubby hippos! Little ones may require some assistance making their way up the slides, so be prepared to get yourselves drenched while helping them, mums and dads! 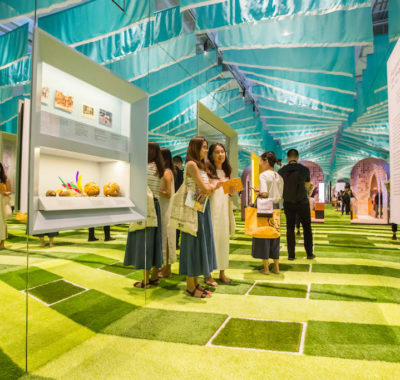 The Far East Organization Children’s Garden at the Gardens by The Bay offers two water play areas – one for the toddlers and the other for kids aged six to 12. There are water tunnels to dash through, stepping springs to get drenched with, and water jets for cheeky young ones to hose down their siblings or newly made friends. Just beside the water playground is a shaded area for parents who prefer to stay dry while keeping an eye on their children. But we really think you should get in on the fun aquatic action too! 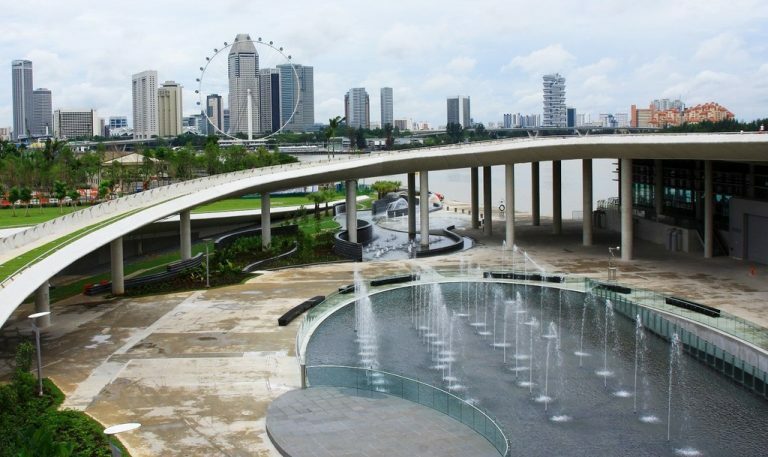 There’s no way you’re leaving the water playground at Marina Barrage without getting soaked. There are about 30 openings from which water gushes out from and they are all unpredictable – that totally ups the fun factor, in our opinion! The downside here is that there aren’t many eateries nearby, so do pack along some food and drinks for your visit here. Better still, why not have a picnic with the family in the evening when the sun isn’t too harsh? The Jacob Ballas Children’s Garden is a miniature wonderland specially designed for little people – adults can’t even enter the premises without a child accompanying them! Though it is not a sprawling space, the water playground here is sufficient for tots to run about, squeal and splash their afternoon away. 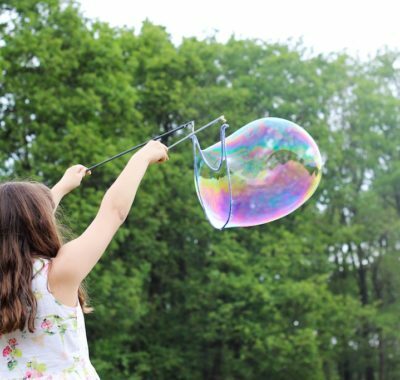 There aren’t many play structures here, so be sure to bring along your kiddos’ collection of water toys! The vast body of shallow water at the rooftop of VivoCity is probably the most inviting of them all, especially in the eyes of little ones. What else is there for children to look forward to here, you ask? Boat rides! Small boats are available for hire at $8 and $10 for 10 and 15 minute rides respectively (for kids aged three to 12, below 45kg and under 1.4 metres in height). If you wish to enjoy a boat ride with your child, you can do so in a big boat priced at $12 and $16 for 10 and 15 minute rides respectively (one adult and one child).